Excellence in Silicone – Our Mission! Silex is your partner for high quality silicone rubber products. We develop and produce hoses, profiles, and molded parts on modern machines according to your needs and specifications and for almost every industry. Products made of silicone meet complex and complicated requirements through their special, extraordinary properties. Resistance to hot air up to 300°C, extremely good weather, UV, and ozone resistance without anti-aging agents, almost unchanged physical properties over a wide range of temperatures, and non-toxicity are only some of the interesting and very remarkable properties that clearly separate silicone from organic elastomers. Just contact us if your solution to a problem requires the use of silicone. We would be happy to help you. One of the important tasks that Silex has is the making of ongoing customer satisfaction improvements. Customer satisfaction is the benchmark for the success and growth of the company. Special focus is on all of the employees when it comes to implementing the goals. Inclusion in the key processes and further training possibilities with training courses are what form the foundation for the company pillars that our employees and customers form. The Silex management has made it its task to sustainably protect the environment. This goal can only be achieved if we demand from each of the employees that he or she handle resources such as energy, water and the used raw materials in a conscious manner. Reducing environmental emissions and preventing environmental burdens. We, the – Silex team – only rest once our customers are satisfied. That is our benchmark! Silex employs highly motivated and dedicated employees in a flat hierarchy and works with select suppliers as if they were our partners. This is the key to achieving our benchmark. Our success proves we are right. Silex products are manufactured on modern extrusion lines and injection molding machines. Whether its a “simple” hose, a complex co-extruded profile, or a highly complex molded part, we can help you to plan and implement your concepts. 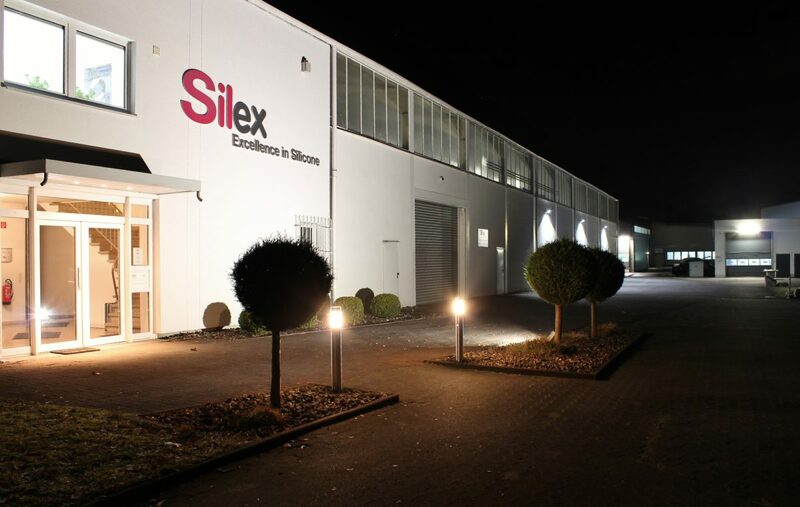 Foundation of the Silex GmbH in Herne. 1100 m² of production space, 300 m² of social and office space and 1000 m² of open space. Relocation of the production to a new facility with about 2300 m² of space. 400 m² annex for the shipping department. One of the two managing directors leaves the company. Extension to 3700 m² of production and storage space, 520 m² of social and office space and 2400 m² of open space. Management buy out by the new executive managers. Extension to 4300 m² of production and storage space and 720 m² of social and office space. Foundation of the Silim GmH & Co. KG for the manfacture of molded parts. Extension to 5600 m² of production and storage space. Our integrated management system is certified according to DIN ISO 9001:2015 and DIN ISO 14001:2015.